Seoul, Oct. 10 (BNA): South Korea is reviewing whether to lift its sanctions against North Korea, Seoul's top diplomat said Wednesday, amid a summit-driven reconciliatory mood. 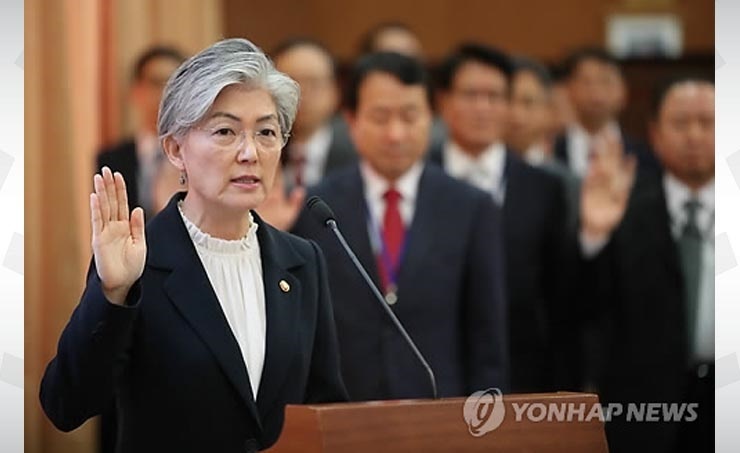 "A review (of the issue) is underway" in consultation with other related government agencies, Foreign Minister Kang Kyung-wha told lawmakers during an annual parliamentary audit of the ministry. Unification Ministry, which handles inter-Korean affairs, is in charge of the issue, S. Korean News Agency (Yonhap) reported. "It's an important executive order. (We) have constantly reviewed it," she pointed out. "As there are many (bilateral) sanctions overlapping the UN ones, it won't necessarily mean the substantive lifting (of sanctions on the North)." On Seoul's financial burden for the stationing of US troops here, the minister reaffirmed that the government will strive for an "appropriate amount." Chung Jin-seok of the main opposition Liberty Korea Party said the US has pressed South Korea to raise its share to around 1.5 trillion won ($1.3 billion) per year from the current 960 billion won. The demand for the hike is aimed at covering the costs for the regular or emergency deployment of "strategic assets" to the Korean Peninsula, he said, referring to advanced US weapon systems like stealth fighters, aircraft carriers and nuclear subs. "We have strongly delivered our position" to the US in talks on sharing defence costs, Kang said. The two sides are trying to work out the date and location of a second summit. Trump said it will likely be held after the midterm elections on November 6, with a few candidate sites being considered. While travelling there last weekend, Pompeo had in-depth discussions on the North's denuclearisation steps and reciprocal measures by the US, the minister said. * DPRK is the official name of the Democratic People's Republic of Korea or North Korea.